I pretty much stuck to their color scheme on the first one shown here, but used my own color scheme on the second. I like the blending of the colors on both, as well as the pattern. Next, I hope to try some of their overdyeing methods to create trees... a pattern I have wanted to do for a few years now. 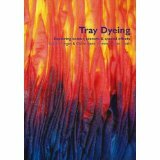 If you haven't had a chance to review this book yet, and you are interested in learning some beautiful techniques for blending colors and patterns, check it out! The other one is a mandala, which I haven't done in awhile... imagine my surprise when I opened it up and found out it worked! So, I got so inspired I decided I need to do these on some shirts! They work best on thin fabrics, so I'm limited to the stock I have that is a lightweight jersey as opposed to the standard weight t-shirts, but I might throw one or two of those in just to see how well I can get them to come out. Artists' Marketplace is coming up on the 30th, and I need to get some more dyeing done! I planted the herbs (a Chia Herb Garden!) about the beginning of February, and recently divided them to put them into larger pots. In the seed beds, I have Delphiniums, Hollyhocks, Chives, Dill, Cherry Tomatoes, Bell Peppers and Cucumbers. I will be planting salad bowl lettuce and carrots directly into the raised beds so they won't need to be transplanted. I have been an off-again, on-again gardener for years, mostly off... I love having beautiful flowers, veggies and herbs... just seems like I can't get myself organized early enough to have enough grow time for everything, especially here in Northern Arizona. I have thought about getting a cold frame to start plants, but couldn't find either a source or even a kit to assemble, and I gave away my power tools a long time ago. But the good news is... I have a neighbor who is a contractor, and I ran into him the other day at a Home and Garden show, right after I visited the Master Gardeners' booth which had photos of cold frames! I sent Lawrence over to look at the photos, and told him I wanted one... well, here it is! He just delivered it yesterday, so it doesn't have any plants in it yet, but I have lots of seeds, peat cups, starter mix, plant food... of course now we are due for two days of wind followed by 2 days of sunshine(during which I hope to get some seeds planted and in the frame!) followed by several days of rain. So hopefully the next photo I take will have a slight green tinge to it... the sign of sprouting seedlings!